Did you know some of the best car loan incentives come from the car manufacturers benefit people with bad credit histories? If not then you will definitely want to continue reading the rest of this article. 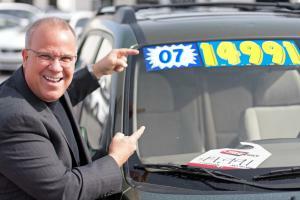 All too often consumers with poor credit get burned on loan deals when visiting local buy here pay here car lots. That is why AutoNet Financial outlines the benefits of auto finance loans from dealers run by the manufacturer. Many people think that there are special times of the year to go car shopping so they can catch the next big deal, which does have some truth to it; however, many local bad credit auto dealers with loan programs offer incentives on their inventory all the time per the request of the manufacturer. So why do sales people only advertise the most obvious deals? Unfortunately, the need to make more money sometimes trumps helping the customer save on their purchase. Dealers often times don't like the idea of losing out on a sale, and since the manufacturing company may not push them to promote the financial incentives they are offering it may not get done. Luckily there are ways that you can get a seller to fold and finance a car with bad credit vehicle financing and receive great rates. Reference the Competition: Life at a dealership is a very competitive one, as there is competition between co-workers and with other lots. Therefore, it's a good idea to mention other deals from the competition that you may have heard about. By doing this you could convince a seller to offer you a great financing on a car, just so that you won't take your business to the dealer down the street. Use the Internet: Loan companies online offer consumers a slight advantage when it comes to getting a used car loan with bad credit, as they offer you the option to get pre-approved for auto financing with very poor credit from home. This way you can inform a dealer how much you could receive from financing and work your way closer to the manufacturer's incentive loans. Walk Away: A salesperson may come off overly confident that they can sell to anyone, but they know that any sale lost is less money in their pocket. That is why you sometimes have to be willing to walk away from certain deals to give the impression that you don't need their service. This can help a seller become more willing to negotiate so you can meet a middle ground. So remember, you can always count on the manufacturing companies to offer vehicle finance incentives for individuals with credit problems. All you have to do is know how to take advantage of them when a dealer does not promote them. Here at AutoNet Financial we help people that earn over $1,500 per month, regardless of how long they have been on the jobobtain the best bad credit auto loan opportunities. We also offer helpful advice on local loan companies, credit counseling, and how to maintain a great auto financing lifestyle that well help get a vehicle loan today.